As I continue to lead the SHRP2 National TIM for Responders course, I am reminded of the importance of personalizing the curriculum for the area where the training is being conducted. The PowerPoint presentation that was developed for this training program was designed to be personalized. There are many opportunities to replace the photos in the stock slide deck with local photos, videos, and information. Why is localization important? The reasons are many. The goal of the training program is to provide responders with current information and best practices in TIM. The hope is that they take this information and make some changes in the way they do the job, and that they promote the value of good, effective TIM with everyone that they work with. For this to happen, we must make sure that the information is presented in a manner that tells the students why the information is important to “them.” It does not demand just a general concept of safety and maintaining an efficient transportation system, but how it affects them personally. In short, the materials must connect to them if we want them to connect to the materials and the lessons underlying. I recently assisted Slade Engstrom, Chad Banka, and Leo Leongson with a SHRP2 class at the 2017 ITS Heartland Meeting and Conference in Wichita, Kansas. The presentation was personalized with information from my files and from the Wichita area. I was very impressed with the presentation that had been developed for the Wichita area. They had added photos and videos from the WichWay TMC to the presentation. These photos and videos were examples of good TIM, and some opportunities. There were also examples from the Wichita area of struck-by incidents. We added some humorous and informative videos to break the ice and kept the attention of the students. The result was a very well received presentation on TIM. There is no doubt in my mind that the information undoubtedly be shared with others. While I promote making the presentation relevant for the responders in the location of the training, I have seen very few good examples. Most of the time the opening slide isn’t even updated to reflect the audience or location of the training. The stock slide deck is used for the presentation. We must do better. With the updated SHRP2 National TIM for Responders Training curriculum being released, and new student handouts being developed, there is no better time than now to develop your own, relevant presentation. There is no area in the country that has been spared the dangers of working in traffic. There are examples across this country of incidents that will help instructors make the SHRP2 TIM training course relevant to responders in their area. This is essential to the continued success of the program. I encourage everyone to update the training program and make it relevant to responders in your area. Please share the information with other instructors in your area, and with the TIM Network. Contact me by E-mail and I will provide information on uploading the files. Together we can make an outstanding training program even better. I need the help of all of you in the response community. How do we demonstrate clearly and concisely what we prevent? I know that we can look at historical data and compare it with current trends and show a relationship. But, show me hard numbers. With the economic benefit of good, safe TIM, we have some excellent tools to help us. Using the accepted costs of congestion from sources around the country, we can analyze incidents by their length and apply the cost information. The good news is that this congestion information is becoming available more and more as TMCs come on line, and promptly share reliable information across all disciplines. Across the country, modifications are being made in motor vehicle crash reports, computer aided dispatch (CAD) systems, and TMC data collections to track this information. While things are changing, we have a long way to go. To gather the necessary information to make the business case for TIM, we must first explain how this information benefits those who are being asked to collect the data. Much like the SHRP2 TIM training, the value of the information needs to be apparent to responders, communications personnel, TMC personnel and others. Good data is essential to the future of TIM. The business case for TIM must be integrated into all SHRP2 TIM training presentations. The future of TIM will continue to rely on those who work directly in TIM for success. For this to happen, our personnel must understand the need for the information, how it directly benefits them, and how valuable each person is to the success of the program. It is up to our TIM champions to make sure that this happens. Summer and vacations are here. So is the heart of the roadway construction season. 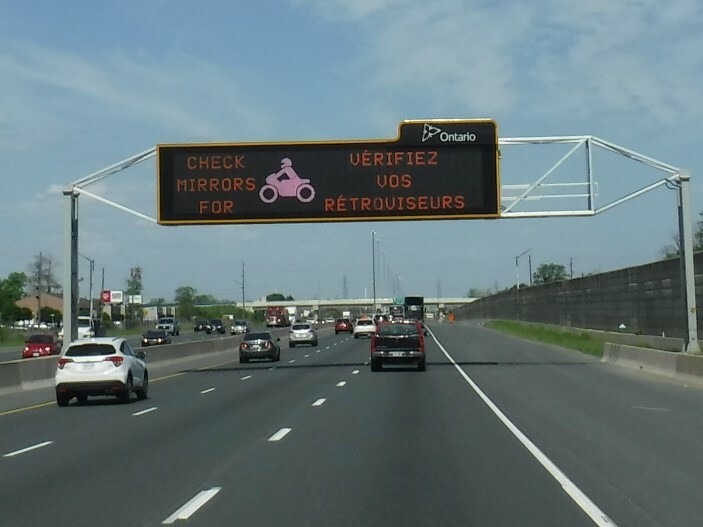 This will mean more travel, and more exposure of responders and highway workers to the dangers of traffic. Don’t drive distracted. Always use your PPE, including high visibility retro-reflective garments when working in traffic. Be the best example that you can be, even when no one is watching. Emergency Vehicle Preemptions (EVP) has the potential to increase safety, reduce response times and save money. Opticom EVP works by sending a request from the vehicle’s emitter to a receiver at the intersection. The receiver passes the request to the traffic light controller in the traffic cabinet. The controller determines whether it will grant the request and then subsequently changes the light. Preemption creates a more predictable traffic situation for emergency vehicles and other drivers. Cross-traffic stops at the intersection and traffic traveling the same direction as the emergency vehicle can drive through the intersection and safely pull over to make way for the emergency vehicle. These conditions reduce the potential for devastating crashes. According to United States Fire Administration (USFA) data1, motor vehicle crashes are the second highest cause of death for firefighters, accounting for between 20–25 percent of the annual line-of-duty fatalities. From 2006 to 2015, 154 firefighters have died because of a vehicle collision, according to USFA records2. Fire vehicle crashes can be very costly and the injury or death of a firefighter or citizen carries a significant financial cost and emotional toll. Secondarily, emergency vehicle repairs or replacements can cost hundreds of thousands of dollars. In addition, the department could be liable for damage and injuries to other vehicles and persons involved in the crash. Insurance premiums for businesses and citizens can at least partially be affected by response time and overall safety. Finally, a delayed response can result in worse outcomes for patients and/or further damage to structures and other property. By creating a familiar traffic situation, EVP can help to reduce crash rates and speed up response times3. Traffic Incident Response Week will be marked Nov. 13-19, 2017, with a focus on the need to recognize that effective response includes every person, every time. We encourage all responders and their parent agencies to do all they can to promote safer traffic movements for motorists, and safer responder practices, as pieces of a whole community approach to safer, more efficient travel. If you or your organization wants to get involved, the first opportunity is a webinar from 3 to 4 p.m. Eastern Daylight Time Thursday, June 22, presented by FHWA with the help of folks from Pennsylvania, Florida, Ohio and other 2016 program success stories. Watch the TIM Network and your usual suspect avenues of communication for more on the kickoff webinar. And until then, stay safe and keep sharing! T3 Webinar: Traffic Incident Management-What’s New? The US DOT ITS-JPO Professional Capacity Building Program (PCB) invites you to an upcoming Talking Technology and Transportation (T3) Webinar. Title: Traffic Incident Management-What’s New? T3 Webinars and T3e Webinars are brought to you by the Intelligent Transportation Systems (ITS) Professional Capacity Building (PCB) Program of the U.S. Department of Transportation’s (U.S. DOT) ITS Joint Program Office (JPO). References in this webinar to any specific commercial products, processes, or services, or the use of any trade, firm, or corporation name is for the information and convenience of the public, and does not constitute endorsement, recommendation, or favoring by the U.S. DOT. My father-in-law and mother-in-law just left on a 30-day motorcycle trip that will take them through much of eastern Canada. They encountered these DMS messages regarding motorcycles as they were traveling. These are good safety messages. 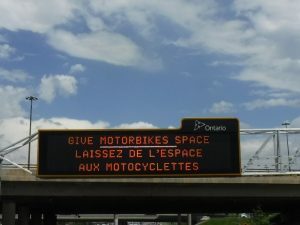 It is good to see that they are using the message boards to promote traffic safety as we are in the United States. Travel safe and watch out for motorcycles. Join the Arizona Fire Chiefs Association for the first joint Arizona Fire Service Conference, July 11-13th in Glendale, AZ! See the link below for further details!